Physicists like to embellish. In their environment, for some time now it has been customary to give “unscientific” names to newly discovered entities. Take at least a strange and enchanted quark. That’s dark energy – not a synonym for dark forces, but a term invented to denote some unusual properties of our universe. The discovery of dark energy was made by astronomical methods and became a complete surprise for most physicists. Dark energy is perhaps the main mystery of modern natural science. It is likely that its solution will be the most important event in the physics of the 21st century, comparable in scale with the largest discoveries of the recent past, such as the discovery of the phenomenon of the expansion of the universe. It is even possible that such a radical development of the theory will occur, that it will become one with the creation of the general theory of relativity, the discovery of the curvature of space-time and the connection of this curvature with gravitational forces. We are now at the beginning of the road, and talking about dark energy is an opportunity to look into the “laboratory” of physicists at a time when their work is in full swing. The fact that in our Universe “something is wrong” became clear to cosmologists by the beginning of the 90s. To clarify what is at issue, let’s start by recalling the expansion of our universe. All galaxies scatter from each other and the observer in each of them seems that it is in her center of expansion; The further the galaxy, the faster it moves away from the center of expansion. It was discovered by observations from the Earth in the 20s of the 20th century. Quantitatively, the expansion rate is characterized by the Hubble parameter. By the beginning of the 1990s, the value of the Hubble parameter in the modern universe was measured quite well: the rate of expansion of the universe today is such that galaxies, 1 billion light-years away from the Earth, escape from us at a speed of 24,000 kilometers per second. In the modern theory of gravity – the general theory of relativity – the Hubble parameter is uniquely related to two other characteristics of the universe: first, with the total energy density of all forms of matter, vacuum, etc., and secondly, with the curvature of the three-dimensional space. Generally speaking, our three-dimensional space does not have to be Euclidean; its geometry can, for example, be analogous to the geometry of a sphere; the sum of the angles of the triangle may not be equal to 180 degrees. In this case, the “elasticity” of space from the point of view of the expansion of the universe plays the same role as the energy density. Thus, within the framework of the general theory of relativity, the measurement of the Hubble parameter determines the value of the sum of the total energy density in the universe and the contribution associated with the possible non-Euclidean nature of three-dimensional space. By the early 1990s, the energy density of “normal” matter in the modern universe was also estimated with good accuracy. “Normal” is in the sense that it experiences the same gravitational interactions as the ordinary substance. So, for “normal” matter, Newton’s law is valid. Case, however, complicated by the fact that most of the “normal” matter – this is not known to us matter (atoms and ions), and the so-called dark matter. Dark matter, apparently, consists of new, not yet discovered in the terrestrial experiments of elementary particles. Unlike many known particles, they do not carry an electric charge, and therefore do not emit light; the matter of which is really dark. The similarity with ordinary matter is that forces of gravitational attraction cause dark matter to gather into clusters – galaxies and clusters of galaxies. She herself attracts matter and light; it was precisely this effect of gravitational attraction that she was discovered. 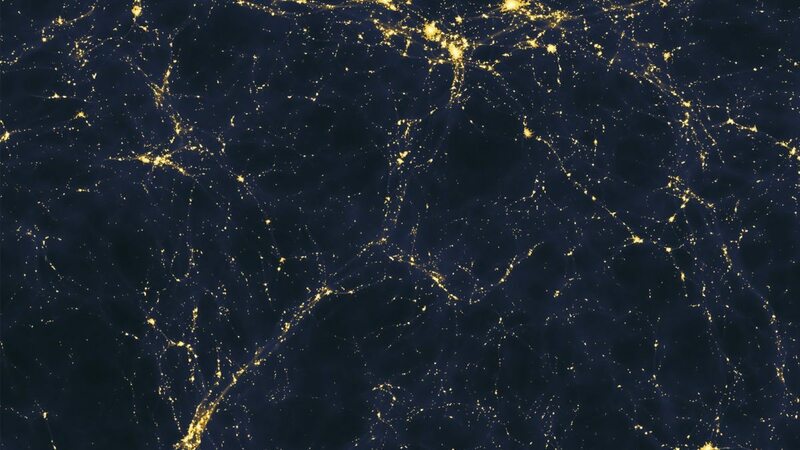 Moreover, measurements of gravitational forces in clusters of galaxies made it possible to determine the mass of dark matter in these clusters, and ultimately in the whole in the universe. Thus, the total energy density of “normal” matter was found (for it the famous formula E = mc2 is valid). And what happened? It turned out that “normal” matter is clearly not enough to explain the measured rate of expansion of the universe. And strongly: “shortage” was about 2/3 (according to modern estimates, about 72%). There were two possible explanations for this fact: either the three-dimensional space is curved, and the missing contribution to the Hubble parameter is related to its “elasticity,” or there is a new form of energy in the Universe, which later became known as dark energy.